Las Vegas, Nevada - Fourteen years ago, on the shores of Semiahmoo Bay, Brad Smith was tired of daily grind. Employed by a major sunglass manufacturer, the days had grown long and the work unrewarding. He needed a change. Reaching back into family history, to the skills and lessons passed on years ago by his grandfather, he left the workplace to pursue what was then a hobby — knife-making. A decision that spurred the creation of Silver Stag Knives. "I was tired of working for somebody else and started making knives out of my garage," said Smith. "They were pretty rough at first, but we got better, stores started placing orders and the business started to grow." Grow into an operation that now employees almost twenty workers in their Blaine, Washington location. With orders coming from all around the world, it appears that the rough edges have been buffed down to a fine, precision edge. "Our knives are beautiful to look at and extreme functionality," Smith claimed. "Over the years, we've got a lot of awards for our work." In fact, it was a Silver Stag knife that served as NRA's 2010 Knife of the Year. But it didn't end there. 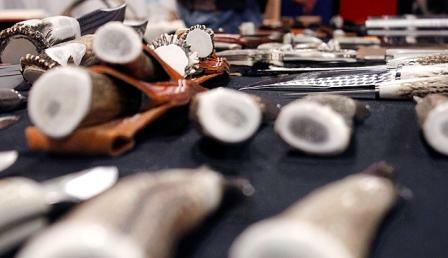 "We made the National Wild Turkey Federation Knife of the Year, KING Ranch Knife of the Year, Mule Deer Federation Knife of the Year, Pheasants Forever 30th Anniversary Knife, Cabela’s 50th Anniversary Commemorative Knife, etc… "
There are two primary reasons for the Silver Stag success — the quality of the raw materials and the quality of the work. "We're the only company in the world using North American deer, elk and moose antler for handles. Nobody else knows how to get the sheds or wants to put the labor into getting them. Once they're refined, the blades are hand ground, hand polished, hand sharpened and hand assembled. Everything, including the leather in the sheaths, is American-made." Handing down keepsakes from one generation to the next is a practice engaged in every culture. Here in the United States, you'll find neighbors and friends who talk about their grandfather's gun, their grandmother's china or their father's '67 mustang. Another favorite piece of family history that finds its way into a descendant's hands are knives. The gift even more special now thanks to Silver Stag. "Most hunters have a favorite set of antlers," said Smith. "Maybe it's a first hunt, a first deer, or a trip you took with your grandfather, uncle, mom or dad. If you send us that antler, we can turn create an heirloom for you." Putting the antler and steel through their regular paces, Silver Stag takes the finished product and engraves (via laser) a name, a date or significant phrase onto the finished product. Placed in either a custom sheath or box, it becomes part of the heritage, a legacy for generations to come. "We're a small little company with a niche in the industry. We got a great bunch of guys who bring in our dogs, listen to music, have fun and make knives all day."